The Prison Service and police are to pool intelligence to stop drones flying drugs and mobile phones to prison inmates in England and Wales. They will forensically examine captured drones to try to find out who was flying them. The invention of easy-to-fly, remote-controlled aircraft has caused a huge security headache for prisons. But critics have called the plan a "red herring" to distract people from "chaos and crisis" in prisons. The national initiative will see police and prison officers share information about the quadcopters and methods used. Prisons Minister Sam Gyimah said: "We are absolutely determined to tackle the illegal flow of drugs and mobile phones into our prisons and turn them into places of safety and reform. "The threat posed by drones is clear but our dedicated staff are committed to winning the fight against those who are attempting to thwart progress by wreaking havoc in establishments all over the country. "My message to those who involve themselves in this type of criminal activity is clear: we will find you and put you behind bars." The Prison Service could not give details about how many officers would be involved, but reports suggested £3m would be spent on the new task force. John Podmore, former head of the service's anti-corruption unit, said whilst there was an issue with contraband in prisons, targeting this money at drones was a "PR stunt". "I have seen no evidence that there is a real problem with drones," he told BBC Radio 4's Today programme. "I think the number of incidents last year was 33. "There are some 10,000 mobile phones found every year in prisons. My question to the Prison Service would be, how many of those were found hanging from drones?" Instead, Mr Podmore thought the service should be looking the wider issue of contraband smuggling, including the "main route [of] staff corruption". 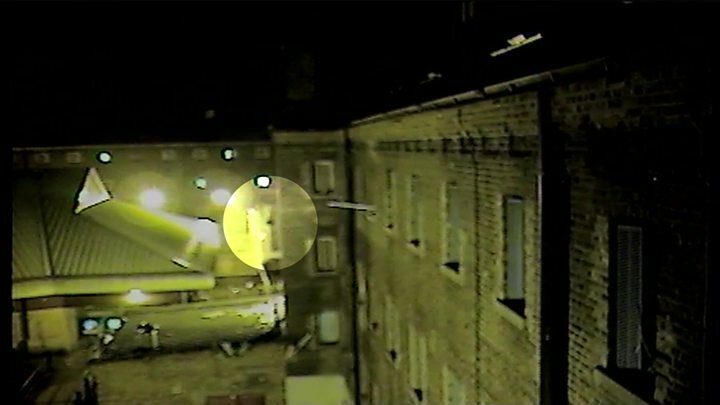 Mike Rolfe, national chair of the Prison Officers Association, said prisoners had told him that they had seen two or three drones a night delivering packages over the walls. However, he said he agreed with Mr Podmore that the initiative was an attempt to distract people from "the real issue [of] jails in complete chaos, in a crisis and flooded with drugs, mobile phones and weapons". BBC home affairs correspondent Daniel Sandford says prison walls are now not much of a barrier for those wanting to smuggle contraband into jails. There have been some recent successes in finding and punishing those who are behind the drone flights, says the Ministry of Justice. In December, Dean Rawley-Bell, 21, was jailed for four years and eight months after he used a drone in attempts to smuggle drugs and mobile phones into Manchester Prison. Renelle Carlisle, 23, was sentenced to three years and four months in October after he was caught outside Risley Prison in Warrington with a drone in his bag, trying to smuggle drugs inside. In July, 37-year-old Daniel Kelly was jailed for 14 months for trying to supply contraband to offenders in Elmley and Swaleside Prison in Sheppey, Wandsworth Prison in London and the Mount Prison in Hemel Hempstead.